If you’ve ever visited ESO’s website or checked our social media, you’ve probably seen an impressive picture of the Very Large Telescope at the Paranal Observatory, with four brilliant laser beams shooting up into the night sky. 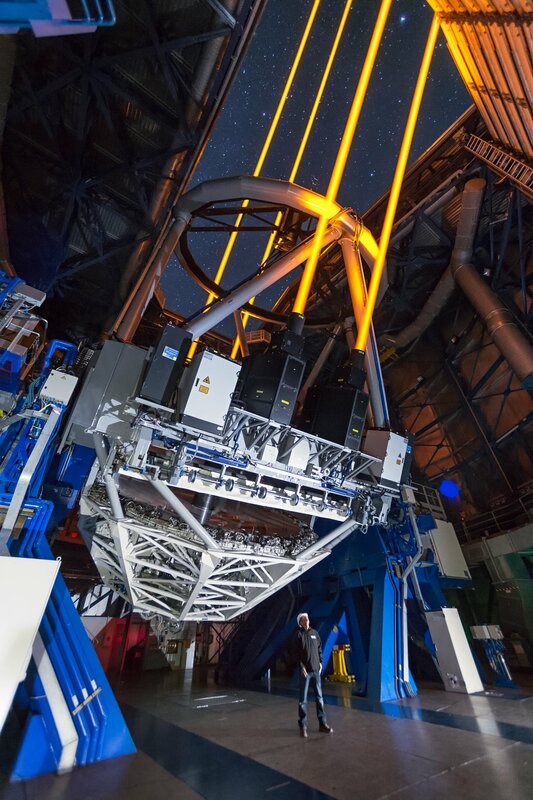 The lasers are only installed on Unit Telescope 4, also known as Yepun, as part of a recently-completed project to turn Yepun into a fully adaptive telescope. The new Adaptive Optics Facility (AOF) saw first light earlier in the year, and we chatted with Robin Arsenault (AOF Project Manager) and Harald Kuntschner (AOF Project Scientist) to find out the story behind this cutting-edge facility. Q: So let’s start off with the basics. Why do we need the Adaptive Optics Facility? Robin Arsenault (RA): A major problem in ground-based astronomy is the atmosphere. In bad seeing conditions, the light from stars and galaxies becomes distorted as it passes through our atmosphere and this affects the quality of the images we obtain. Harald Kuntschner (HK): Seeing is an astronomical term that is a measure of how much the atmosphere moves. Bad seeing results in smeared out images. For example, two close stars might appear as one. Seeing can change a lot every half an hour — even every minute — and to get a better image, you either have to get very lucky on a clear night, which might take years to randomly achieve, or you can improve the conditions artificially and vastly boost the chances of taking good data. 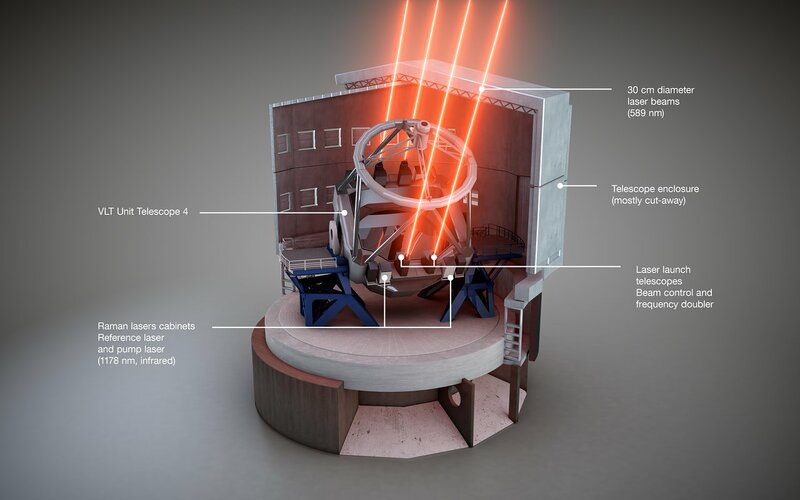 This schematic view shows how the Four Laser Guide Star Facility is installed on the Unit Telescope 4 of ESO’s Very Large Telescope. The different components are labelled. The AOF system is essentially equivalent to raising the VLT about 900 metres higher in the air, above the most turbulent layer of atmosphere. RA: The AOF is our solution to this. It’s an adaptive optics system designed to correct for this blurring effect of the Earth’s atmosphere in real-time, allowing us to see astronomical objects in much finer detail. It has several fundamental components, including the four 22-watt lasers, which create artificial guide stars in the upper atmosphere by stimulating sodium atoms there. The adaptive optics system uses these stars to determine the turbulence of the atmosphere — to create a kind of map — and calculates corrections a thousand times per second, which make the thin secondary mirror constantly change its shape to correct for the distorted light. Finally, the corrected light is directed into an instrument to actually take the scientific observations. HK: For the first scientific light of the system, we used the powerful MUSE instrument and produced some really fantastic images of globular clusters, planetary nebulae, and more. Q: Why is the AOF so exciting? How will it benefit the science done by the VLT? 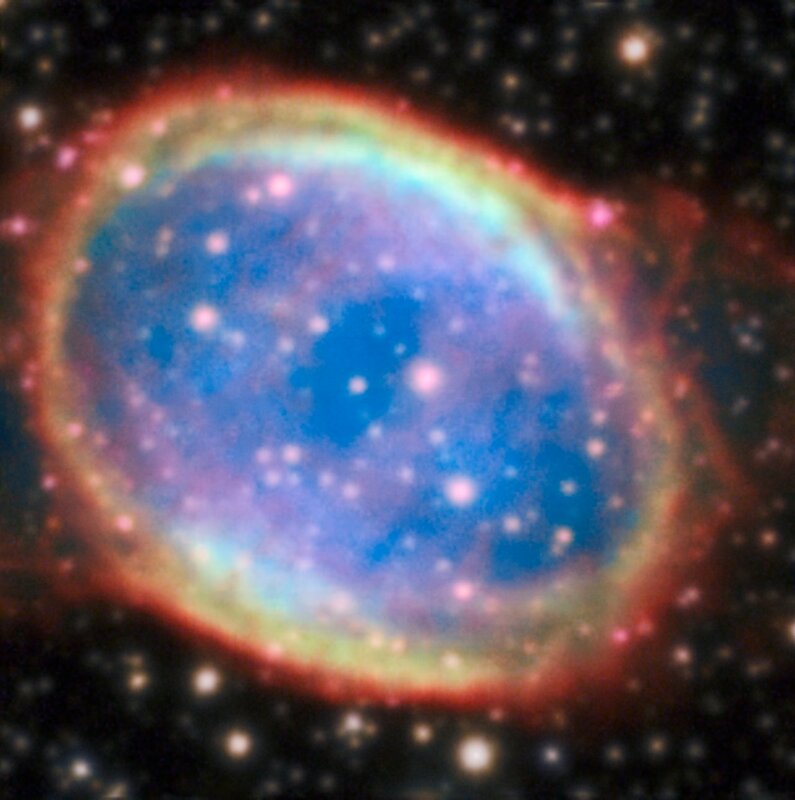 RA: The end result of the system is a much sharper image than what we could have obtained without adaptive optics — it reveals much finer details and very faint objects. The AOF system is essentially equivalent to raising the VLT about 900 metres higher in the air, above the most turbulent layer of atmosphere. In the past, if we wanted sharper images, we would have had to find a better site or use a space telescope — but now with the AOF, we can create much better conditions right where we are, for a fraction of the cost! 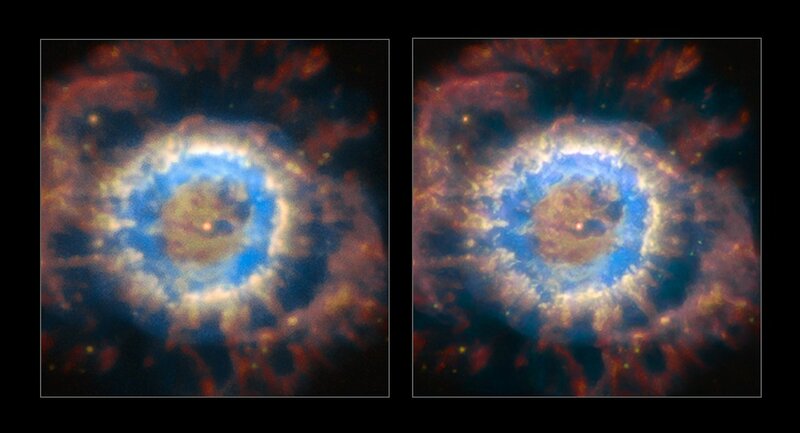 The planetary nebula NGC 6369 seen with natural seeing (left) and when the AOF is providing ground layer corrections for the turbulent atmosphere (right). The AOF provides a much sharper view of celestial objects and enables access to much finer and fainter structures. HK: Right now, comparison images only look like a small improvement over natural seeing conditions, but for astronomers this is fantastic and will pay off even more in the near future. One amazing thing is that the AOF can also work over long time periods, for several hours, which is key to taking excellent long exposure data — such as with MUSE, which, although a huge step up in efficiency, requires up to fifty hours of data for a deep field. Glistening against the awesome backdrop of the night sky above ESO’s Paranal Observatory, four laser beams project out into the darkness from Unit Telescope 4 (UT4) of the Very Large Telescope (VLT). Q: What were the biggest challenges you faced when building the AOF? 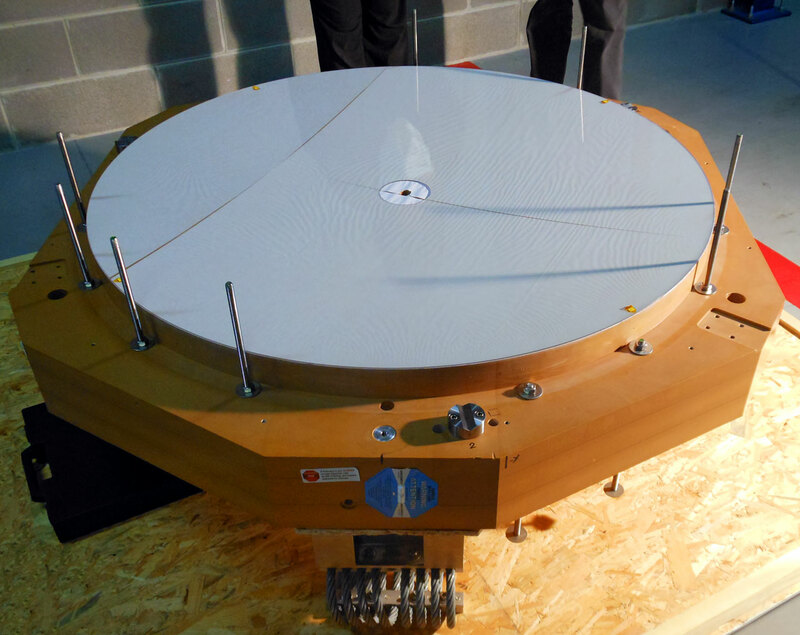 A mere 2 millimetres thin but 1.12 metres in diameter, this thin shell mirror was delivered to ESO by Safran-Reosc in 2014. HK: The first challenge in my mind was building the very large deformable secondary mirror (DSM) with the many actuators, which began before I joined the project in 2009/10. Making what’s essentially a movable 2mm-thick shell of glass 1 metre in diametre hanging above the main mirror was a bold choice, but it has delivered on its promises. The handling procedures of the shell and the DSM have taken place so many times now in both Garching and Paranal — without incident! — that despite the mirror’s fragility, I’m confident it is in safe hands. RA: I definitely agree that the deformable mirror was a major challenge. At the time we started the project, the secondary mirror we had in mind was a big step up from previous units, but it seemed like an excellent stepping stone for even larger secondary mirrors — such as for the Extremely Large Telescope. During the test phase of the mirror for the AOF, we did experience a couple of serious failures. We didn’t plan these, but we knew they were more likely to happen early on, and thus it validated our strategy to have a long and thorough test period in Garching so we had a chance to resolve them. Such failures on the telescope would have been so much more complicated to resolve and would have caused much unwanted telescope downtime. Another challenge was building the lasers for the 4 Laser Guide Star Facility. After early technological difficulties, we made the decision to outsource the laser procurement — a courageous and somewhat unpopular decision, but in the end it paid off. Once we had found a suitable company, Toptica, it went rather straightforwardly, but the period of 2007 to 2009 was highly tense as a failure to find a laser supplier could have brought the AOF project to a stop! Q: What is the most exciting aspect of your involvement in the project? HK: For me as astronomical support, it was helping to bring the project to a successful end by knowing a lot of technical details while keeping the science opportunities in close sight. We started this with MUSE, providing a correction for the ground layer of the atmosphere over a wide field of view, and saw excellent results in commissioning. I expect to see this continued with HAWK-I and the next step for MUSE: a narrow-field mode that will correct for turbulence at any altitude. RA: I feel truly grateful to have had the opportunity to work with so many people at ESO on this project. I kept being amazed at their motivation and drive to accomplish their tasks for the AOF. It has been such a long project — over ten years — and they all did their part within their capabilities, and all had a different way of tackling it. Some were more efficient, some better documented their work, some were more practical… but in the end all the deliverables were up to specifications and each engineer and technician was behind their work 100%, supporting the AOF all the way to the telescope commissioning. This stunning image of the planetary nebula NGC 6563 was obtained with the powerful symbiosis between the AOF and MUSE, revealing the faint nebula structures as never seen before. Left: without adaptive optics. Right: with the AOF. Q: What are you personally looking forward to the most when using the AOF? HK: Personally, I’m keen to see objects that have previously been imaged by MUSE in much better spatial resolution. I’m interested in looking into the centres of galaxies and studying how their cores work, and to take much sharper images of objects within galaxies, such as globular clusters. This system essentially enables my research — I couldn’t do it without the AOF. RA: I won’t be using the AOF for science myself, but my concern is to keep these high-tech systems performing well and making sure the staff at Paranal have been given the tools to maintain them and operate them at maximum efficiency. To summarise, I’m looking forward to an efficient operation of the AOF with well-tuned systems! Q: One last question — what’s the future of adaptive optics technology, at ESO and worldwide? HK: ESO is driving the development of these systems. In particular, we’re showing the applications with instruments to see how the science improves, demonstrating the excellent results that can be achieved. In the future, the AOF will be used with instruments other than MUSE, including HAWK-I, which is a near-infrared imager. Later on we’ll also use the AOF with the upcoming instrument ERIS. Artist’s rendering of the ELT in operation. 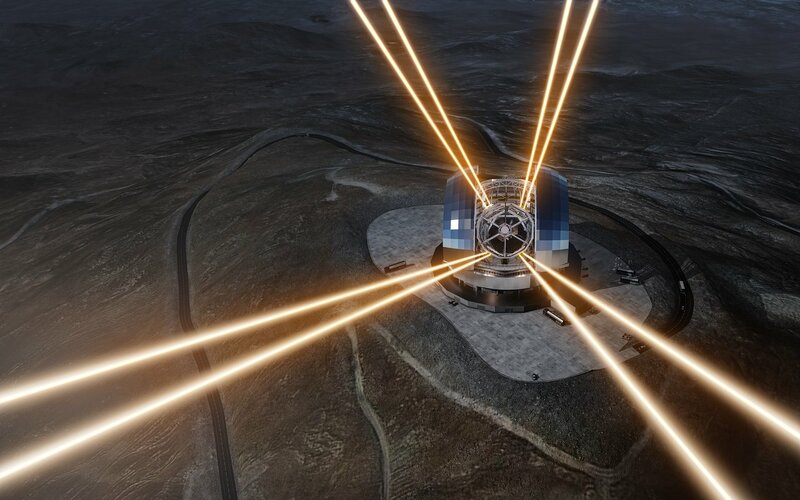 RA: The AOF is really also a pathfinder for the Extremely Large Telescope. Of course, they’re different facilities, but we’ve learned an incredible number of things from building the AOF that will be helpful for the ELT — how to fine-tune an adaptive optics system, how to operate it, how to precisely understand the problems and how to improve the efficiency... All of these things were fundamental learning curves that will help us with the ELT. And it’s not only the scientists and engineers who have benefited — our industry partners have also gained invaluable experience and expertise, which they can use to overcome the challenges of building the ELT. 2 The thickness of Yepun’s deformable secondary mirror in millimetres. 4 Number of lasers in the 4 Laser Guide Star Facility. 10+ Number of years spent building the Adaptive Optics Facility. On the Ground lets you discover the operations of ESO’s sites, facilities, and advanced ground-based telescopes. 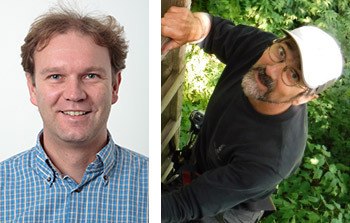 Find more blog posts about research done at ESO’s sites here on the ESOblog.